1. About 30 minutes after moisturizing, I apply Revlon ColorStay Makeup (B) in Ivory around my eyes, the top part of my cheeks, and my nose. My sister introduced me to ColorStay foundation when she visited this summer and I still rely on it when I need full coverage. 2. Then I apply Aveda Inner Light Mineral Tinted Moisturizer (C) in Sweet Tea. I use this wherever I didn't apply ColorStay foundation and then blend them so I have lightness where needed around the eye area, but a more natural tone everywhere else. I've said it before and I'm saying it again. I really enjoy putting on the Aveda tinted moisturizer. It feels soooo good on my skin! The broad-spectrum UV protection helps me feel more confident when I'm on the go. 3. 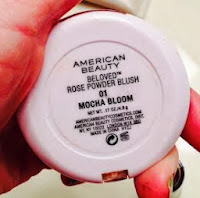 I use a discontinued American Beauty rose powder blush (F) in Mocha Bloom that I got from the Look Good Feel Great program through the American Cancer Society. 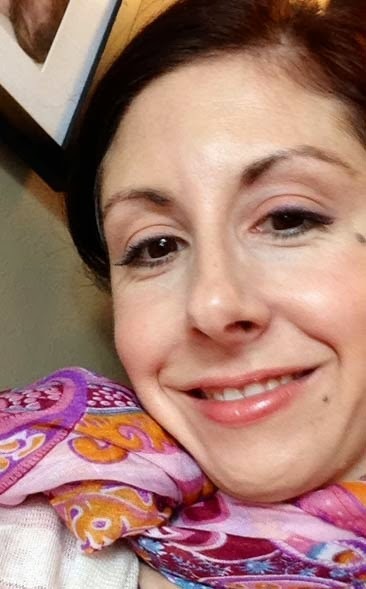 When I was going through chemo, it helped me look fresh and rosy even though I was really pale and sallow. It's still my favorite blush, though it's probably time to find a replacement before I can't find mine anymore. When it's time to buy a new blush, I plan to buy American Beauty Blush Perfect Cheek Color in Decadent Pink. With 18 shades and a natural finish, there's bound to be one you love! 4. My weekend daytime look is relaxed, so I use eyeshadow to define my eyes rather than harsh eyeliner, and finish it with a coat of brown-black mascara. Revlon CustomEyes Shadow & Liner (E) is serious stuff. You only need a little color to have a big, lasting impact. I use the Party Pops set, which doesn't appear to be a current palette. Revlon offers a similar set, Rich Temptations, which includes four eyeshadows and a liner. You can mix and match colors to create a subtle or more dramatic look. It's easy to go from day to night with CustomEyes! For day, I prefer Boots No7 Exceptional Definition Mascara (G). The wand works brilliantly and my lashes look thick and defined. 5. 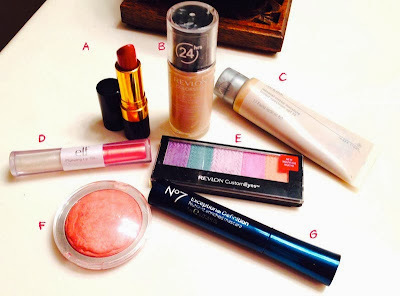 To finish off the look, I use a light coat of E.L.F. Plumping Lip Glaze in Oasis #2901 and brush a little Revlon Super Lustrous Lipstick in Goldpearl Plum 610 for a more rich appearance.